Καὶ βαπτισθεὶς ὁ Ἰησοῦς ἀνέβη εὐθὺς ἀπὸ τοῦ ὕδατος· καὶ ἰδού, ἀνεῴχθησαν αὐτῷ οἱ οὐρανοί, καὶ εἶδε τὸ Πνεῦμα τοῦ Θεοῦ καταβαῖνον ὡσεὶ περιστερὰν, καὶ ἐρχόμενον ἐπ’ αὐτόν. και βαπτισθεις ο IC ευθυς ανεβη απο του υδατος και ϊδου ανεωχθησαν αυτω οι ουρανοι και ϊδεν το ΠNA του ΘY καταβαινον ωσει περιστεραν και ερχομενον επ αυτον . * (.) = a letter erased = ν? i.e. εἶδεν? (b) Καὶ βαπτισθεὶς or βαπτισθεὶς δὲ? Καὶ and δὲ are often interchanged by the scribes, and when conjoined, not infrequently one or the other was expunged as superfluous. 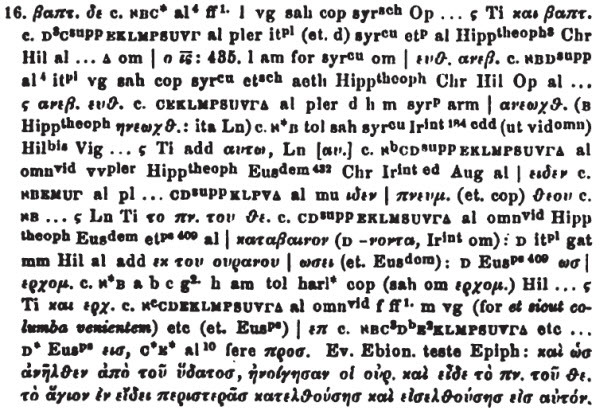 But where the manuscripts fluctuate between καὶ and δὲ, internal evidence, more particularly in Matthew and John, is in favour of the former, as being Hellenistic and founded on the Hebrew idiom. Compare Rom 4:3 and James 2:23 with Gen 15:6 in the Septuagint. (c) καὶ εἶδεν τὸ πνεῦμα τοῦ Θεοῦ καταβαῖνον ὡσεὶ περιστερὰν καὶ ἐρχόμενον ἐπ’ αὐτόν – like a dove : see Philo’s Quis Rerum Divinarum Heres sit (Who is the Heir of Divine Things?) where Philo compares Wisdom with a dove. XLVIII. (234) For our own mind is here compared to a dove, since that is a creature which is tame and domesticated among us; and the turtle dove is compared to the model presented by the other, that is to say, by the mind of the world, the heaven; for the word of God is fond of retirement, and solitude, and privacy; not mixing itself up with the crowd of things which have been created and will be destroyed, but being at all times accustomed to roam on high, and being anxious to be an attendant only on the one supreme Being. Therefore, the two natures are indivisible; the nature, I mean, of the reasoning power in us, and of the divine Word above us; but though they are indivisible themselves, they divide an innumerable multitude of other things. (235) For it is the divine Word which divided and distributed every thing in nature; and it is our own mind which divides every thing and every body which it comprehends, by the exertion of its intellect in an infinite manner, into an infinite number of parts, and which, in fact, never ceased from dividing. (236) And this happens by reason of its resemblance to the Creator and Father of the universe; for the divine nature, being unmingled, uncombined with any thing else, and most completely destitute of parts, has been to the whole world the cause of mixture, and combination, and of an infinite variety of parts: so that, very naturally, the two things which thus resemble each other, both the mind which is in us and that which is above us, being without parts and indivisible, will still be able in a powerful manner to divide and distribute all existing things.